Are they the one? Should you take that job? Feeling confused and not sure what to do? Don’t worry – fortunica will connect you with experienced spiritual advisors who will help you to make the right decision. • Receive daily advice and support for your decisions. • Get the answers you deserve about your love life, relationships, and career from clairvoyants. • Deal with grief or difficulties with guidance from professional psychic advisors. 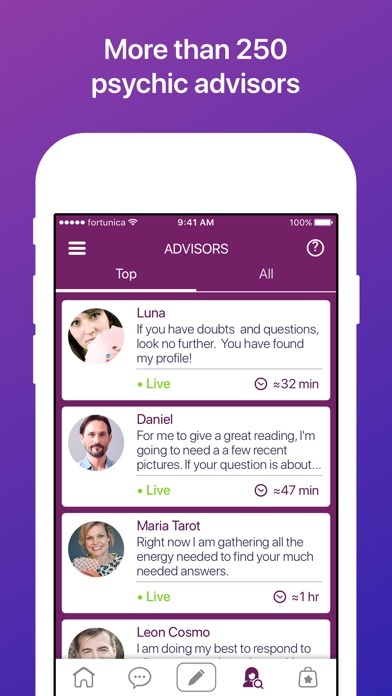 Fortunica - receive advice and solutions for your everyday life. 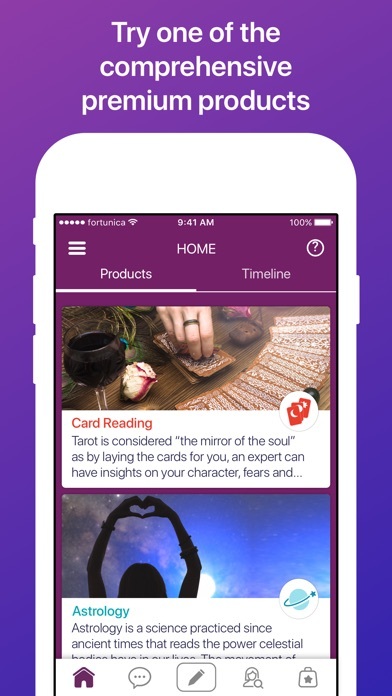 The only psychic advice app that has been featured in over 17 countries and helped solved over 1,000,000 questions – just like the ones that you have. Want to clear your mind? Need an answer right now? • Get your first 2 questions at an incredible price, with our promotional starter pack! Session based products: Enjoy our comprehensive and complete counseling sessions in the following areas: • Card reading • Astrology • Palm reading • Rituals Select one of our session based products, your preferred advisor and then receive your comprehensive and private counseling. During the session, you can ask the medium several questions and focus on important aspects of the consultation. Have you always wanted to get a spiritual consultation, but haven’t had the opportunity yet? fortunica offers you a risk-free introduction to the spiritual world. You’ll find more than 75 psychic advisors from all over the world, who will support you in the area of ‘love and relationship’, ‘career and employment’, ’destiny’, ‘grief and loss’ and ‘important changes in life’. Check it out and get started now! What are our users saying? "Been using this app for 2 years with many advisors, always catered with predictions and it is never sugar coated, it is as it is." Sally P. – UK "This app really works!! I recommend it to anyone who has a serious question about their future. Really great, I love it! " Ben M. – USA "Fast accurate and to the point. Worth every penny " Vanesa H. – USA Every psychic is unique. • Choose from a variety of spiritual advisors such as astrologers, psychics, mediums, clairvoyants, tarot card readers or fortune-tellers. Browse the various profiles, check all the info, and you've found the perfect psychic advisor for you, simply send your question. Get inspiration for your life. 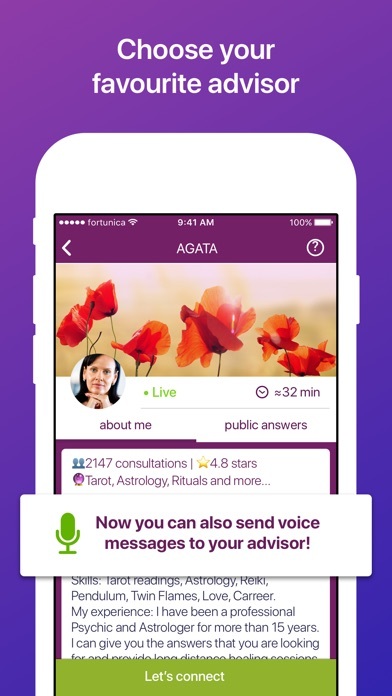 • You can write your question on the timeline, and an advisor will answer you. Your question and their answer will appear (anonymously) on the public timeline, allowing other users like you to get inspired by reading them. • Browse through the timeline, and find out the most common questions are solved in the spiritual community. The anonymous questions and insightful answers on the timeline will help you as well! What to ask? • Have you met someone on an app and want to know if this relationship will last into the future? Connect with advisors that can tell you if you are soulmates. • Want to fix your limping relationship or find out if you will get to meet an old friend again? Ask an advisor to check with their tarot cards, peek into their crystal balls, or swing their pendulums for you! What services? • Astrologers read the stars and constellations for you, fortune-tellers use their tarot, angel, and lenormand cards to help you make the right decisions. Experienced psychics, mediums, and clairvoyants are using their pendulums, and crystal balls to guide you through your life with their spiritual insights. Other exciting methods such as reiki healing, runes, numerology, palm reading, coffee cup reading, horoscopes are also at your disposal. What will your decision be? • No matter what kind of question you have in mind: love, relationships, job & career development, destiny, grief & loss, or essential changes, ask an advisor & get the answers you need! Email us with your questions and feedback at hello@fortunica-app.com . We are looking forward to hearing from you. I’m very mad at this app. All it did was take my money. Loveharmony is a fake and she will say things based on the way u ask the question. I wish I could get my money back at least for questions I asked her. My friend tried her out and she was wrong too. The worst. I’ve been using this app for about 4 years now, and I have to say I’m impressed! I didn’t rated a 5 because I have encountered some advisors who were not so accurate or answered with a question. But most have given me guidance and great advice. Thank you! Responses are generic and they emotion anything that you mentioned in your question. Don’t waste your time and money. For real psychics go to keen or fiverr. There is no way to contact customer service and you can’t see how others rated that advisor to see if he is accurate. I have other apps and it actually makes the advisors more accountable... you are in the dark with this app except for some public reading which gives you no clue if it is accurate or not. You could be talking to a charlatan and you would be none the wiser. I just had an advisor completely ignore my question and there is no customer support button to complain or to have the advisor re-read my very clear question. I’m not happy... in other apps I would contact customer support and have either the money credited back or the advisor get back to me. But if the advisor had reviews you would also know if they do the a lot. The Brazilians were the most accurate advisors... only reason I didn’t delete the app yet. The app is truly easy to navigate. The readers are all amazing and accurate. I highly recommend it. 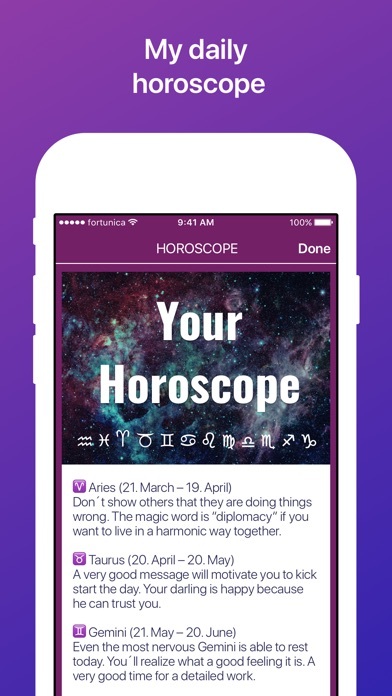 Don’t waist your money on this trash app they only give advices more then a energy reading. I used to talk to Deborah the most but she is more like a therapy then a psychic . By the way I delete this I ain’t going to continue to do spend my paycheck on some advices for that I can call my friend.